Ho Tao (Gordon Liu of Kill Bill fame) begins an arranged marriage to a Japanese childhood sweetheart Kung Zi. Unfortunately marital bliss is interrupted by each other’s love of their own cultural martial arts, Ho Tao Chinese Kung Fu and Kung Zi Japanese karate. They constantly fight (literally) and bicker over which technique is supreme, finally Kung Zi leaves in a huff to Japan to better her fighting skills. When a series of misunderstandings spirals into an international incident, Ho Tao is forced to take on several of Japan’s most powerful martial arts masters, each an expert in a different discipline seeking to punish Ho and restore Japanese honour. Ho Tao is a young master of a Chinese kung fu school, his wife Kung Zi a practitioner of various Japanese martial art disciplines. Ho disapproves of his wife’s hobby by calling her style unladylike, leading to several amusing physical confrontations. As Ho is obviously the better trained his victories humiliate his new bride and she flees to Japan to cure her wounded pride at the side of a ninjitsu master Takeno, who has obvious designs on her. Ho writes a challenge to Kung Zi hoping it will bring her back to him; unfortunately it is badly written and shows little respect to Japanese martial arts. When Takeno reads it he is insulted and gathers 6 other masters along with his sensei to confront Ho and take up his challenge. Ho is advised to fight each master one a day to avert escalating the problem. He first faces up to an iadio master practiced in the art of samurai katana sword fighting. Ho betters him with his Chinese jian sword, but mistakes his defeated foe’s surrender which further antagonizes the Japanese contingent. The fights will now take a greater and potentially deadly intensity. Next is the karate master who Ho counters with a drunken boxing style learnt the day before by watching a drunk (played by director Lau Kar-Leung). He then defeats a nunchaku/tonfa combination with his three sectional staff. Japanese yari spear versus Chinese qiang spear follows with Ho distracting his opponent with his spear’s red horse mane adornment to get the victory. Next a Japanese master of the sai, with a nose twitch that would make Samantha of Bewitched proud, meets his defeat at the fast hands of Ho’s butterfly short swords. The judo master arrives to challenge Ho one minute after midnight not allowing our hero any rest; he seems to be getting the better of Ho until Ho strips down and covers himself in oil. As judo relies on grappling Ho easily slips out of any hold applied leaving the Judo master to concede. Kung Zi is worried for her husband and warns Ho of the ninjitsu skills of his final opponent Takeno, she also educates him in his disrespect of his first opponent who offered Ho his sword. The last fight is the longest and most varied including ninja weapons like the ninjato sword, shuriken stars, disguise, poison and a bizarre crab style which Ho counters with throwing darts, a dao saber and crane kung fu. Takeno believes he has poisoned Ho and carries his body to the other masters, Ho however has held his breath long enough to fool his foes and carry the win. The samurai lashes out at Ho but is restrained by an honourable Takeno. Ho finally shows humility and praises the skills of the defeated Japanese assemble. This gesture is reciprocated by the samurai who again offers Ho his sword, this time a better learned Ho accepts with both hands ending the film on a happy note of dual respect. 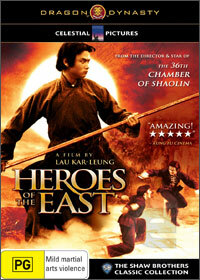 Part of the Dragon Dynasty range this is a great martial arts action movie with some elements of humour between the newly married couple of Ho Tau and Kung Zi. The range of weapons and styles on display is brilliant and maintains the interest the whole way through. Gordon Liu must be given praise for the sheer number of fight scenes he appears in and his great mastery of many weapons and kung fu styles. The Japanese are never portrayed as evil and are given respect, plus no one dies which makes the film suitable for the kiddies as well. Picture quality is very good shot in 2.35:1 with a running time of 101 minutes, surprisingly good actually as the film harks from 1978. Dolby Digital 2.0 is in Mandarin with English subtitles with well defined sound. Extras are interesting with a great insightful interview with start Gordon Liu, feature commentary from Hong Kong cinema expert Bey Logan, and a Trailer Gallery. My favourite though is an exploration of the weapons used in the film. We are shown some of the techniques used with these classic fighting arms by a charming female Asian host, great stuff, I recognize her from the extras in Fist Of Legend another great Dragon Dynasty disc. A great martial arts showcase where the action and skills are at the front, PG so everyone can enjoy and a great history lesson in various Chinese and Japanese fighting styles. Get this if you love any Bruce Lee film or want to explore this genre, get this if you just marvel at magnificent fighting sequences and action. One can see a young Tarantino watching this and wanting to honour its star Gordon Liu one day for all the enjoyment he brings here. Dragon Dynasty has delivered an all time classic yet again, well done to you.